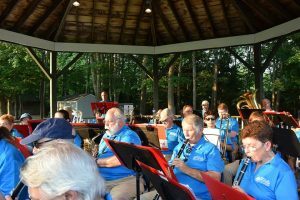 The Maine POPS Concert Band (formerly, Italian Heritage Center Concert Band) has been active since its founding in 1988 by Richard A. Capozza. Today the band has over 80 active members, ranging in age from high school students to retirees, and from all walks of life. We give about fifteen concert performances a year. During the summer months we put on a series of ‘Pops’ Concerts and perform at venues such as the Deertrees Theatre in Harrison, the Bath Gazebo, The Atrium in Portland, 100 State Street, Sea Dogs Ballgames and Deering Oaks Park. We play a diverse selection of music, including pop and show tunes, big band jazz, patriotic favorites, symphonic melodies and marches by American masters. The group enjoys inviting outside groups to be a part of our performances. Special guests have included Toshi Shimada, former conductor of the Portland Symphony, Dr. Peter Martin, Director of Music at the University of Southern Maine, members of the Southern Maine Children’s Choir under the direction of Lise Dunn, The Atlantica Sax Quartet, Maine Ballroom Dancers. The Blueberry PANCakes Steel Drum Band, vocalists from the USM School of Music, and the Italian Heritage Center Chorus. We participate in “Music in Our Schools,” a mentoring and outreach program working in collaboration with local schools. 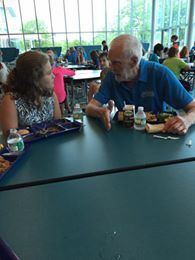 We have been involved with both Saco and Falmouth Middle School band programs, holding annual concert events with students in those band programs. NO AUDITION TO JOIN THE MAINE POPS CONCERT BAND! We accept players of all nationalities, creeds, ages and occupations. We are always looking for new members. No auditions required!! Rehearsals are Wednesdays, 7:00pm to 9:00pm at Scarborough High School Band Room, 11 Municipal Drive, Scarborough, Maine – September through June. If you are a high school student just out of school who is looking for a place to keep playing that instrument, someone who just found their horn in a closet and thinks they’d like to play again, or you just want another band to play in, come give us a try! Contact Christina Campion-Marshall at 207-332-4914 or mainepopscb@yahoo.com for more information.